The Giant Sunburst lotus is a perennial hardy aquatic pond flowering plant that grows in hardy zones of four to eleven. It belongs to the lotus family of nelumbonaceae. It can grow to a height greater than five inches. This eye catching plant has a magnificent display. Its aquatic perennial root tubers colonize the soil at the bottom of the aquatic environment in which it is established or the soil contained in the containers that are fully submerged in an aquatic media at the bottom. The plant can grow deep in the waters with its stem growing to a depth of five feet below the water surface and two to six feet higher above the water surface. The Giant Sunburst lotus plant spreads with strongly upright flowers and leaves. Its rate of growth is very fast in an ideal aquatic habitat. It has early circular blue green leaves with the leaves stem attach to it centre.th is forms a foliage which is in the shape of a shallow bowl. 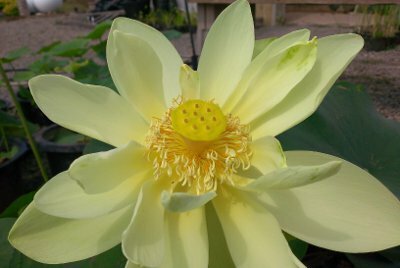 The magnificent giant sunburst lotus has wide blossoms that have creamy white petals. At the center of its blossom, is a flat topped edifice known as the capillary receptacle. Its receptacle contains the plants stigmas that later develop into the plants seed pods containing the seeds. Around the base of its receptacle is a larger yellow stamen. Its flowers are usually attractive to bees. The Giant Sunburst lotus is a free flowering lotus plant. Its blossoms can grow as large as eight inches to a maximum height of twelve inches blossom. The creamy yellow flowers towers above its large waxy foliage. In addition, they can close at night and still open the next day. Its enormous blossoms white petals and its gently blue leaves enable the plant to go with everything. The Giant Sunburst lotus tubers cannot do well in very cold conditions but can remain hardy anywhere with deep waters in which the surface pond waters do not freeze all the way down to the soil.